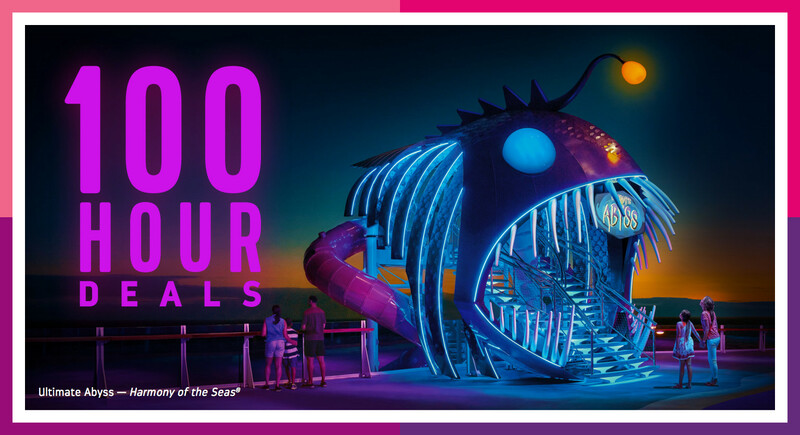 Royal Caribbean will offer bonus instant savings of up to $100 for cruises booked over the next 100 hours, in addition to the current 60% off second guest promotion. Royal Caribbean cruises booked between October 21 - 30, 2016 applies to sailings on or after November 19, 2016 (excluding China departures). This deal was extended through October 30 by Royal Caribbean on October 26. 60% off cruise fare of second guest booked in the same stateroom as first full fare guest. 30% cruise fare savings for 3rd and 4th guests booked in the same stateroom as first two qualifying guests. Eligible Caribbean and Bahamas holiday sailings, offer includes a per stateroom savings based on stateroom category. $50 off per stateroom for interior and oceanview and $100 off per stateroom for balcony and suite categories. $100 off per stateroom for interior and oceanview, $200 off per stateroom for balcony, and $300 off per stateroom for suite categories. BOGO60 is combinable with 3rd and 4th Guest Savings, Instant Savings, Holiday Savings, Anthem Free Upgrade, Crown & Anchor discounts and NextCruise offers. BOGO60 and 3rd and 4th Guest Savings are not combinable with restricted rates. Instant Savings and Holiday Savings are combinable with restricted rates and NextCruise offers. Instant Savings and Holiday Savings are not combinable Crown & Anchor discounts. All offers are not combinable with any other offer or promotion.